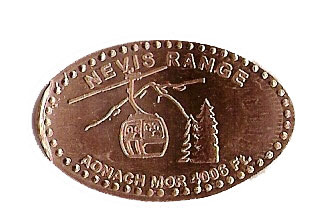 Nevis Range is located in the heart of the Scottish Highlands, on the mountain of Aonach Mor, the eighth highest peak in Britain. Directly adjacent to Ben Nevis the centre boasts spectacular views, which on a clear day can extend as far as the Inner Hebrides. The centre is highly accessible, being just 7 miles north of Fort William off the A82 to Inverness; it falls on one of the most travelled tourist routes through the Scottish Highlands. 1) '[Nevis Range Admach Mor 4006 FT.', Gondola car on cable in front of mountain and tree.